Portland Basin during the Canals Festival. 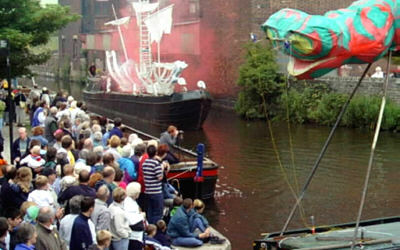 Every year, for three days around mid July, the Tameside Canals Festival takes place. 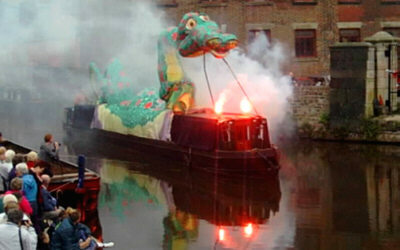 It has traditionally been located around Portland Basin, Ashton under Lyne. 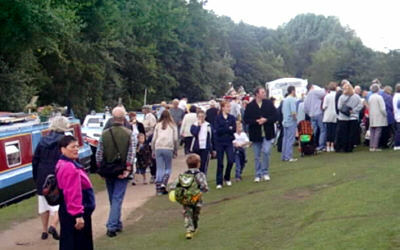 The festival was originally organised by the Huddersfield Canal Society as a way to raise funds for canal restoration. 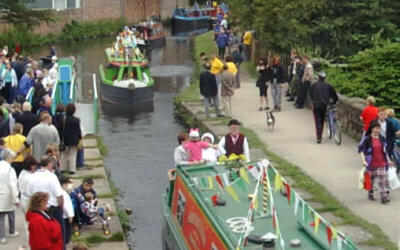 Having attracted large crowds for more than twenty years, the Canals Festival has now become an important feature in the calendars of Tameside, especially Ashton under Lyne and Dukinfield. 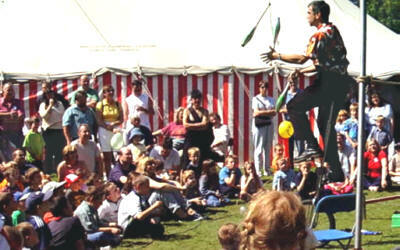 The festival is now organised by an independent group to raise funds for the local Willow Wood Hospice. 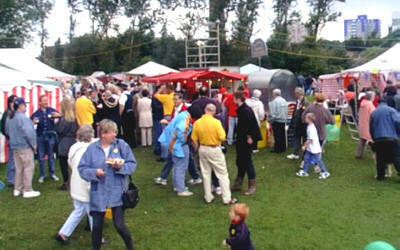 The photographs on these pages show the festival held at Portland Basin in July 2000. The festival is spread out along the banks of the Ashton and Peak Forest Canals, live entertainment, beer and refreshment tents, craft marquee, various stalls and narrow boat rides. 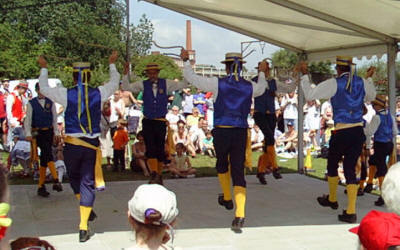 Throughout the weekend a variety of dancers entertain crowds in the Festival of Dance. There is live music in the evenings. At each venue each band performs two pieces - a march performed on the move, where they may be awarded marks for deportment, and a set piece performed on a temporary band stand or in a ring. The judges of these pieces is concealed in a caravan or nearby room, awarding marks without knowing the bands' identities. The results are announced at the end of the evening, which can be close to midnight. 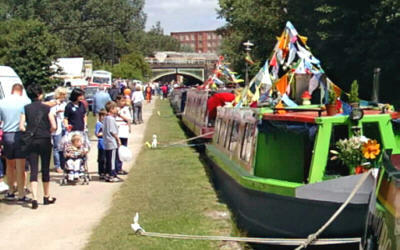 Each year the Festival attracts narrow boats from around the country. There is a competition for boaters who decorate their boats. The main show area just south of the Dukinfield Aqueduct on the Peak Forest Canal. 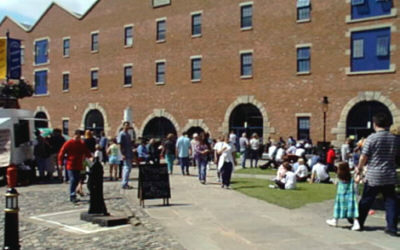 Portland Basin Museum forms the backdrop for the Canals Festival. 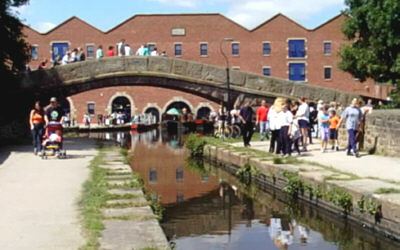 The Festival site spreads along the Peak Forest Canal. Boats from around the country come to the festival. 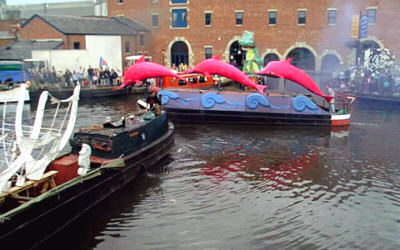 Decorated boats taking part in a parade. 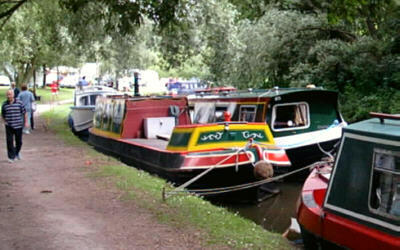 Boats lining the Peak Forest Canal. 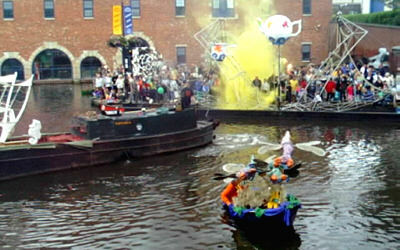 Entertainment at the Canals Festival. Visit the Traditions index page to find out about more local traditions around Ashton.